What you do when you have nothing to do very surely determines what you will eventually have to do. The precursor above was not specifically about reading. Yet, it matched the two part template. The first part was about choices, and the second part was about the consequences. The first part began with “What you”, and the second part used the keyword “determines”. The quotation being explored may have evolved from this precursor, or the expressions may be unrelated. “It is what you read when you don’t have to determine what you will be when you can’t help it,” Charles Francis Potter told students of the schools, whom he urged to read more books than they were compelled to by their course of study. “What you read when you don’t have to, determines what you will be when you can’t help it,” according to Mr. Potter. If you cannot enjoy reading a book over and over again, there is no use reading it at all. It’s what you read when you don’t have to that determines what you will be when you can’t help it. 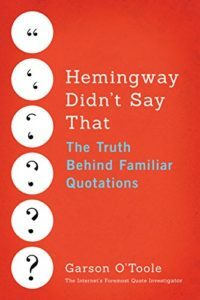 QI conjectures that one or more readers of this reference work incorrectly looked above the second quotation to determine its attribution and assigned the words to Oscar Wilde. This mistake fits into a category called textual proximity errors. A quotation is scooped up and reassigned to a well-known name that appears nearby in the text. In conclusion, Charles Francis Potter should receive credit for this saying which he used multiple times. QI suggests using the June 1927 version. The ascription to Oscar Wilde is spurious. Image Notes: Picture of open books displaying pages from Free-Photos at Pixabay. Image has been cropped and resized.